Although Britain has a number of war museums, the Imperial War Museum (IWM) is acknowledged as the Holy Grail of them all—the one you must visit when in London. You won’t have a chance to get bored at the Imperial War Museum, located in London’s fashionable Chelsea district. You’ve got to love a museum that greets you with a behemoth pair of 15-inch naval guns from two British battleships. Entering the cavernous main entry hall (appropriately named the “Large Exhibits Gallery”), you’re brought to a standstill by an astounding display of infernal machines of war: a towering V2 rocket; a V1 flying bomb hovering menacingly overhead; several howitzer artillery pieces; a dogfighting Mark1A Spitfire, North American P-51 Mustang, Focke Wulf Fw-190, and Heinkel He-162; a German one-man Biber submarine; a copy of the “Little Boy” atomic bomb casing that America dropped on Hiroshima; several World War II tanks including Montgomery’s “General Grant” tank used in the deserts of North Africa; a Russian T-34; an M4A4 Sherman V; a German Jagdpanther Tank Destroyer; and the Tamzine, a small fishing boat that took part in the Dunkirk evacuation. You could (and should) spend an hour just navigating this hall before moving on to the other galleries. Once you pull yourself away, continue down to the ground floor to the “World War I,” “World War II,” and “Conflicts Since 1945” galleries. It makes sense to view the eight WWI galleries first, and then move on to the World War II section that covers the Blitzkrieg (where you sit in a bomb shelter listening to—and feeling—an air raid taking place above you, then emerge into a diorama of destruction), the Battle of Britain, the Home Front, the War at Sea against Germany and Italy, the Mediterranean and Middle East, the Eastern Front, Europe Under the Nazis, the Bomber Offensive, the Northwest Europe campaign, and War in the Far East. These themes are vividly illustrated through extraordinary documentary films, informative signage, historic photos, realistic models, uniforms, weapons, medals, authentic posters, maps, documents, and more. The main entrance gallery is crowded with a spectacular array of military artifacts from WWII. Many of the artifacts have great historical significance, including Hermann Göring’s tunic and the large bronze Nazi Eagle liberated from the Reichstag in Berlin. Other artifacts are very poignant: Red Cross food parcels that sustained Allied POWs through the bitter months of 1945 when Germany’s food supply was collapsing under the Allied onslaught, a POW’s teapot made of food cans, and their metal eating utensils. The Secret War gallery on the first floor is not to be missed. It tells the story of how the British MI5 decoded enemy wireless traffic and arrested German agents almost as soon as they landed in Britain. Networks of civilians in France and Belgium were set up to pass on strategic information to the British, while the Special Operations Executive (SOE) recruited over 13,000 men and women from military and civilian backgrounds to wage a war of attrition in Europe. Look for the captured German Enigma encoding machine, films of agents training, weapons, secret radios, and other spy paraphernalia. The Holocaust exhibition on the third and fourth floors is one of the most powerful and effective exhibits you’ll ever see in a military museum. It illustrates this dark period of the war very professionally, bringing home the horrors of the Third Reich’s efforts at genocide. The introductory gallery illustrates how Hitler and his gang influenced Germany and why the German people perpetuated or tacitly supported mankind’s worst plunge into depravity. The exhibits and displays in the next dimly lit gallery leave you shaken and pondering the question, “How could such a cultured country go astray so badly?” Parents will need to put some thought into whether their children are prepared for this rather grim section. The museum building itself is suitably staid for the purpose of showcasing Britain’s glorious military history. Completed in 1815, the current museum was the central portion of a mental hospital, converted into the military museum in 1936. 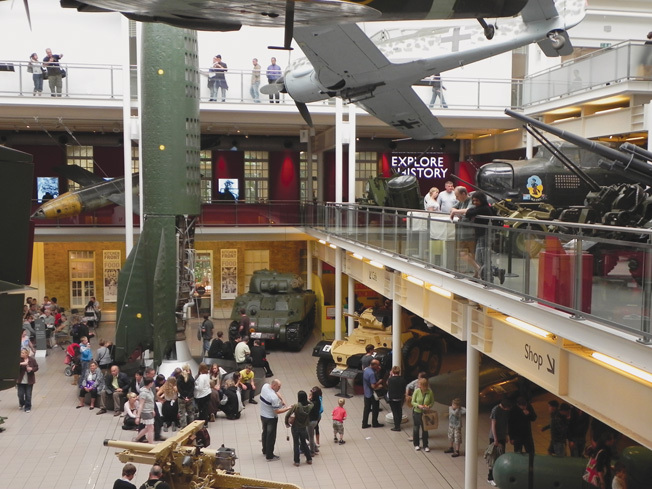 Plan to spend a full day at the IWM, although you might be better dividing it up into two half days to properly absorb the detailed information that is presented at every turn, and the overwhelming number of exhibits. It’s also a good idea to take a mental breather every couple of hours while you enjoy lunch or refreshments in the café. It would be ironic to suffer from “shell shock” in a military museum. 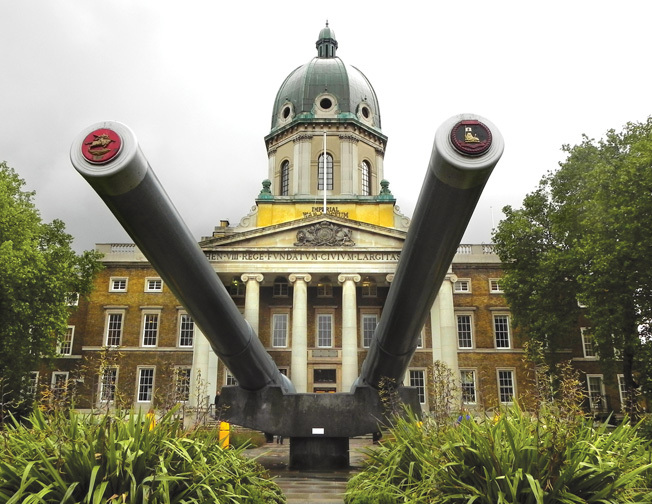 Rather than repel visitors, a pair of imposing naval guns outside the Imperial War Museum welcomes tourists and gives a hint at the treasures to be found inside. An audio guide is available to let you tour the museum at your own pace. There’s also a highlights tour of the main galleries, which covers 40 key exhibits. The museum’s guidebook is well worth the price to read as you go through the galleries, and the excellent gift shop stocks an impressive selection of books, toys, knick-knacks, and militaria. Entry to the IWM is free, except for special displays. Be sure to get a map of the museum to get you oriented—the museum is large and there is much to see. If you have only limited time, you would be wise to prioritize which galleries you wish to visit. The IWM has a number of other branches throughout London and England, including HMS Belfast (anchored in the Thames River), the fascinating underground Cabinet War Rooms near Whitehall, the IWM at RAF Duxford, and the IWM North at Manchester.